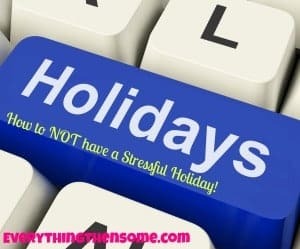 How to NOT have a Stressful Holiday! Hello thanks for coming back! During the holidays I see people stressing over dinners that they have to make for their family and friends, so I figured I would share what my family does during the holidays especially Easter, Thanksgiving, and Christmas. Rent a place big enough for everyone. We have a place that we go to where everyone can fit comfortably, we rent out an apartment complex clubhouse. This way everyone knows where to meet every holiday and make sure it is in a convenient location. People will more than likely want to meet in a middle location, this way no one feels as if they have to go too much out-of-the-way of the other members of the family. Make it like a pot luck. This is the number one thing, the most important, the best stress-free way to have a holiday dinner. Figure out how many people are coming and then decide what you need. After that comes the delegation! First, tell them what they need to bring and then let them pick a second dish of their choosing. This way everyone brings what you feel the dinner needs to have and then the second dish, you are letting them choose something. The second dish can be more dessert or can be an extra dish, that way you have two of something, which equals more. This will allow everyone to take something home with them. This way they don’t have to worry about cooking something the next day when all they want to do is lay around and relax. These three pieces of advice will help you and your family have a stress-free holiday, whether it be Thanksgiving or Christmas and even Easter if you do something big for that day as well. So true, This is GREAT advice! Holidays can be so stressful and your tips save a lot of unneeded tension. Thanks for sharing! Thank you for stopping by Sherri! Jennifer, I came across this post this morning. Solid advice! I will be sure to share this with our network of parents. Thank you Angel for stopping by! Thank you for sharing as well.